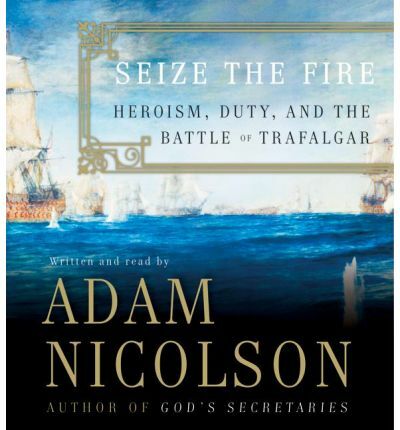 In Seize the Fire, Adam Nicolson, author of the widely acclaimed God's Secretaries, takes the great naval battle of Trafalgar, fought between the British and Franco-Spanish fleets in October 1805, and uses it to examine our idea of heroism and the heroic. Is violence a necessary aspect of the hero? And daring? Why did the cult of the hero flower in the late eighteenth and nineteenth centuries in a way it hadn't for two hundred years? Was the figure of Nelson -- intemperate, charming, theatrical, anxious, impetuous, considerate, indifferent to death and danger, inspirational to those around him, and, above all, fixed on attack and victory -- an aberration in Enlightenment England? Or was the greatest of all English military heroes simply the product of his time, "the conjuror of violence" that England, at some level, deeply needed? It is a story rich with modern resonance. This was a battle fought for the control of a global commercial empire. It was won by the emerging British world power, which was widely condemned on the continent of Europe as "the arrogant usurper of the freedom of the seas." Seize the Fire not only vividly describes the brutal realities of battle but enters the hearts and minds of the men who were there; it is a portrait of a moment, a close and passionately engaged depiction of a frame of mind at a turning point in world history. About the Author: Adam Nicols on is the author of Seamanship, God's Secretaries, and Seize the Fire. He has won both the Somerset Maugham and William Heinemann awards, and he lives with his family at Sissinghurst Castle in England.